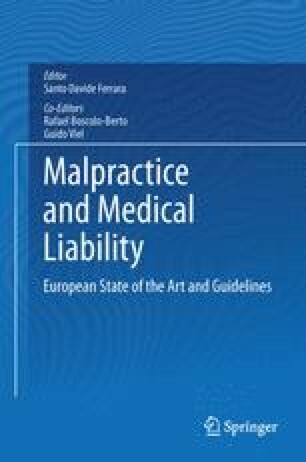 The first section of the chapter gives an overview of the judicial and normative situation of medical liability in Spain, including an analysis of extra-judicial institutions and operative roles. It defines the diverse cases of mala praxis from the point of view of doctors and healthcare professionals acting as “free professionals” and those who are functionally dependent upon a private healthcare institution, also discussing cases in which the healthcare institution itself acts defendant. This section also discusses out-of-court settlements and criminal medical liability, providing some statistical data concerning claims of medical liability. The second section of the chapter focuses on the ascertainment methodology in living persons and cadavers, expert ascertainment in professional liability and clinical information obtained before and after a potentially liable act. The third section deals with the evaluation criteria for living patients and cadavers. This chapter ends with a discussion of future perspectives and the possible reforms that may occur in Spain concerning medical liability.